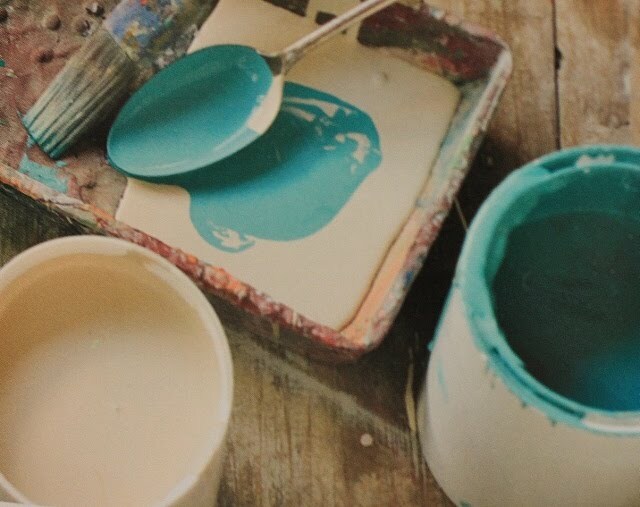 What in the world is chalk paint? I’ve been asked this many times. 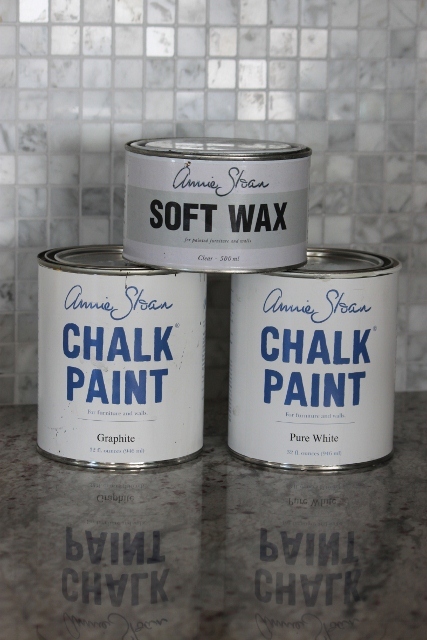 Annie Sloan Chalk Paint is not the same as Chalkboard paint (which I also love to use). It is a paint made specifically for painting furniture, floors, walls, etc. It creates a smooth, velvety finish that, when sealed with the Annie Sloan Soft Wax, lends a gentle glow to your furniture. I am in LOVE with this paint! Keep reading and I’ll tell you why . . .
Annie Sloan Chalk Paint has revolutionized furniture painting for me. With this paint there is no stripping, sanding, priming, painting a first coat, waiting for days for the paint to cure, sanding again, painting a second coat . . . for anyone who has refinished furniture, you know the time-consuming nature of it all. NOW . . . with this wonderful medium . . . all I have to do with that shabby little piece I picked up at the neighborhood garage sale, is dust it off and start painting! One coat is usually enough to cover. The paint dries quickly and can be sealed the same day with the wax, which comes in either clear or dark, to give it a more aged appearance. There are a wide variety of colors available and they can be mixed to make custom colors. It is really all about experimenting until you get just the look you want. For this piece I combined Arles and Antibes Green. I was a little worried about what my husband’s reaction would be to such a vibrant color right in the middle of our living room, but when he came home from work he absolutely loved it! 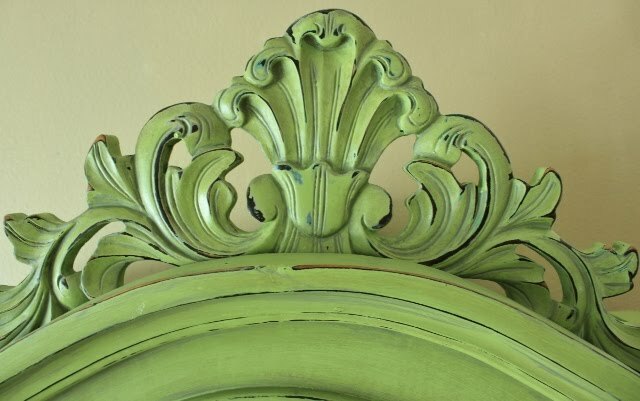 Part of the beauty of chalk paint is in it’s versatility. In my experience, every piece of furniture seems to call for a different finish. While one item may be just perfect with the silky smooth effect achieved with a coat or two of paint and clear wax, another (like the piece above), seemed destined for the use of a sanding sponge (this paint is so easily distressed) and dark wax, to end up looking like a much cherished piece of furniture. Most of the time I prefer furniture that has a little bit of an aged and distressed look. I believe that there is great beauty in imperfection. It has been a cool and drizzly Spring in the Pacific Northwest. Though I long for the sun, the weather has been kind my plants and flowers. This year we’ve been enjoying the many birds in our yard as we’ve hung our first ever bird feeders. Is that a sign of old age to get excited by birds? Well, I decided I had to have some bird pictures to go with a new duvet cover I ordered for my bedroom. Of course I didn’t want to pay full price! I found several picture frames at our local thrift store, spray painted them in an antique white, and sanded off a little paint to give them a distressed look. I found sheet music on the Internet that I printed off on parchment paper. This would be my background for the bird pics. Next I searched the web for the perfect pictures, still not wanting to spend much money. I ordered some bird notecards but, when they came, they weren’t quite what I was hoping for. Maybe I would suddenly need to become an expert bird photographer. Well . . . as luck (or blessing) would have it, when I went into our local bird supply store to buy some feed I noticed a beautiful framed photograph of a goldfinch hanging on the wall. When I commented on how much I liked it the owner of the store showed me a stack of postcard sized pictures by the same photographer . . . and they were FREE! Though I wanted the whole stack, I wasn’t greedy. I only took as many as I needed! The colors are a perfect match to the colors I’m using for my bedroom re-do. Check out the finished product. What do you think? The picture frames were something old, cast off by their original owner. I painted over them to change their original look which, by the way, was pretty darn ugly. I chose to distress them so they don’t look brand new. I love the look of time worn beauty.